Alex Rodriguez and ex-wife Cynthia Scurtis make co-parenting look easy! The former MLB star posted a sweet photo on his Instagram page Thursday with his daughter Ella, 8, and Scurtis, 44, just one day after news of his relationship with Jennifer Lopez broke. The athlete wrote, “Parents-Teacher Day at Ella’s school,” as the caption. Rodriguez frequently posts photos of his kids during sporting events, at a baseball field or even at home while watching an awards show. Rodriguez and Scurtis share two kids, including eldest daughter Natasha, 12, whom he calls “Tashi.” The two were married in 2002 before separating in 2008. Meanwhile, the Shades of Blue star broke things off with Drake after a source who knows both of the entertainers told PEOPLE it was never an official relationship. She was previously married to singer Marc Anthony, with whom she shares twins Max and Emme, 9. She was previously married to Cris Judd from 2001 to 2003, and Ojani Noa from 1997 to 1998. On Wednesday, a source confirmed to PEOPLE that Jennifer Lopez and Alex Rodriguez have been “dating for a few weeks.” While the news came as a surprise to fans, the superstar — who was most recently linked to Drake — and the Yankees legend actually go way back … to May 21, 2005. The “Shades of Blue” singer is a diehard Yankees fan, so it’s safe to say she’s been a longtime fan of Rodriguez, 41, who played on the team for 10 years. On that fateful day 12 years ago, however, Lopez, 47, attended the Yankees game alongside her then-husband Marc Anthony, 48, who was rooting for the Mets. Luckily for all future J-Rod shippers, what appears to be the first time the hot new couple crossed paths was captured on camera. As both teams geared up to play some ball at the Shea Stadium in Queens, Lopez — with a huge smile on her face — was snapped shaking hands with Rodriguez. She and Anthony — who was scheduled to throw out the first pitch at the Subway Series Game — also posed for a photo with the sportsman, who married at the time to Cynthia Scurtis (the pair split in 2008). Though Rodriguez and Lopez certainly had no idea what the future held for them then, it turns out Rodriguez has always been charmed by the entertainer. In the words of Kelly Ripa, "They've never dated before?" On the heels of news that Jennifer Lopez and Alex Rodriguez are in the midst of a burgeoning romance, the daytime talk show host said what everyone was thinking about these two wildly famous stars. Perhaps it's hard to believe this is the first time they're seeing each other because they're a match made in Hollywood heaven. While Ripa pointed out on Thursday morning that they both have excellent nicknames, that only scratches the surface of all this power couple has in common. To start, they're at the top of their industries—Lopez is a Golden Globe and Grammy-nominated performer who sells out arenas around the world while Rodriguez is considered one of the best baseball players in history. As the leaders of their individual fields, Lopez and Rodriguez make an undeniably compatible duo, strengthened even more by their similar ages, Latino backgrounds and the fact that they're both parents. However, arguably the strongest thread that binds them is their storied romantic pasts. Lopez, a self-proclaimed romantic, has been married three times with several more high-profile relationships sprinkled throughout her time in the spotlight, most recently with backup dancer Casper Smart followed by a brief fling with Drake. "I'm a relationship girl," she told James Corden during her Carpool Karaoke segment. "I'm so monogamous, it's stupid." 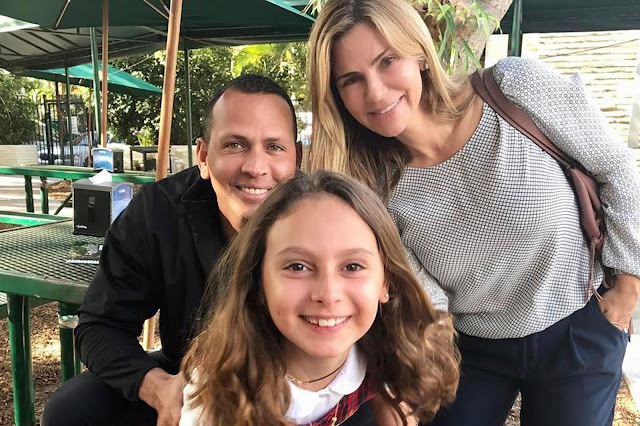 0 Response to "Alex Rodriguez Shares Photo with Daughter and Ex-Wife at Parent-Teacher Day"